Young County records are maintained by the Graham County clerk. Unrestricted informational copies of vital records since 1903 can be requested by email, mail, phone, fax, or in person from the clerk or online from TexasOnline, the official eGovernment state website. Certified copies, restricted to qualified applicants for 25 years (death certificates) or 75 years (birth certificates), cost $20-$22. Records prior to 1903 are housed at the Texas State Library Genealogy Section. 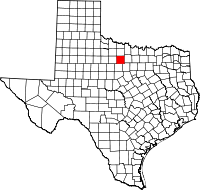 Young County was created in 1856 from two counties (Bosque and Fannin), after the US military outpost established in 1851 encouraged Anglo-American settling. The Native American tribes were the Brazos, Caddoes, and Wacos.